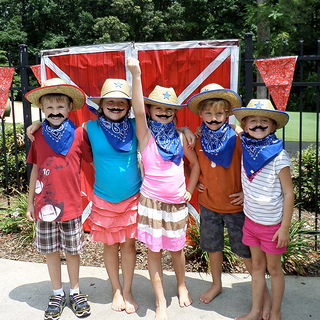 Here are some great western party ideas for a Yee Haw pool party theme. Our granddaughter takes riding lessons and loves horses. For her birthday pool party theme, she chose a cowboy/cowgirl party theme. 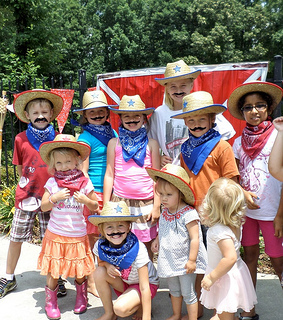 Provide cowboy hats, bandanas and mustaches for each of the party guests. (Adults enjoyed them too). Before heading into the pool get some pictures to use for your thank-you cards. The deep red barn doors make for great western party decorations as well as a great place for photo ops. They are made of a thin piece of vinyl. I stapled a long piece of cardboard across the top of each vinyl barn door and then hung them over the fence. I did the same across the bottom to keep the doors from blowing up. 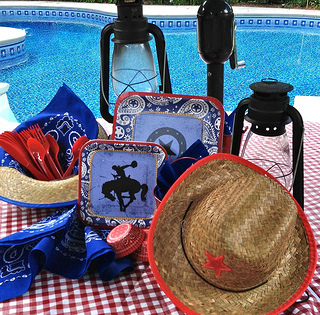 Barn red and royal blue western party decorations turned this pool area into the Wild West. 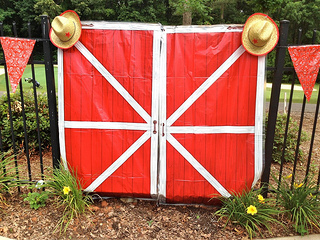 Cowboy hats, bandanas, pennants, barn doors and horses are simple and easy ways to decorate for this pool party theme and made for great photo ops as well. I love the color scheme of the royal blue and deep red. The colors just pop. For outdoor parties the bolder the colors the better. 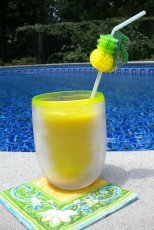 Place wagon wheels by the pool entrance, hang it on the pool gate or put it by the party table. These are plastic so they can get wet. At 23" they make a party decoration that will stand out. 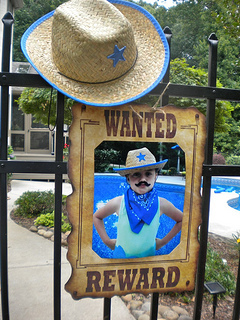 Beginning at the pool gate, hang a Western Wanted Sign of the birthday girl/boy with a cowboy hat sitting on one of the metal posts. I found the poster at Amazon and then took a picture of our cowgirl. I had two 8x10 pictures made up and then used the second one at the party table. 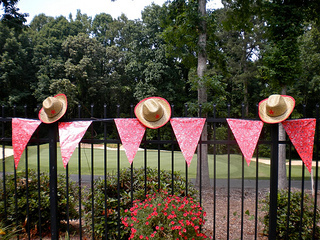 Hang Bandana Pennant Banners on the pool fence in several places adorned with some cowboy hats on the fence posts. The banner was a bit orangey/red rather than deep red. At first I was disappointed, but once it was hung on the fence it looked great. It's vinyl rather than paper, which is great for around the pool. 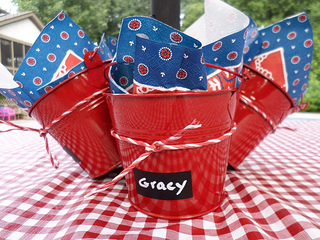 Red gingham umbrella table cloths and blue and red tin pails provide lots of color to the tables. There's lots more fun stuff to get besides paper goods! Take a picture of the birthday boy or girl with a cowboy hat, bandana and mustache. Insert a 8 x10 picture into the Wanted/Reward frame. Use it at the party table and hang another one on the pool gate. 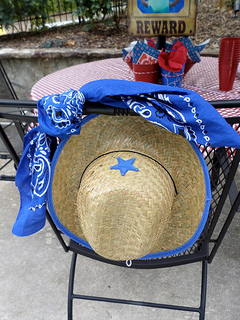 A garden post was the perfect spot to set a cowboy hat with a coordinating bandana. A Large Brown Stallion greeted guests as they entered the pool area. He hung around for days and made a great addition to the party. 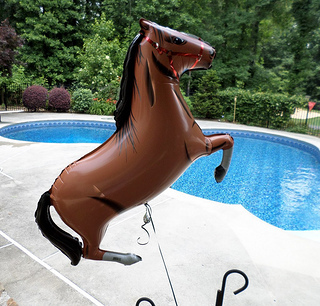 Can I say that these inflatable horses were the hit of the party? 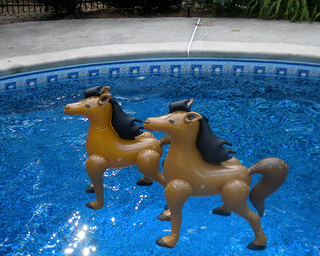 Have them floating in the pool when the guests arrive. If you blow them up completely so that they are nice and firm, they will stay standing up and just float across the top of the pool. Use them for your western party games as well. 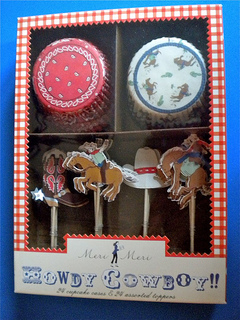 Cowboy party supplies include lots more than just paper goods. 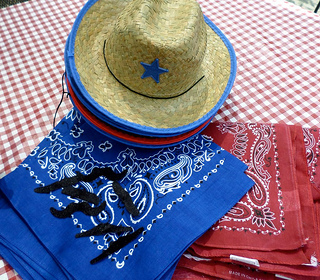 Colorful bandanas, cowboy hats, mustaches, and inflatable horses add color and fun to any western party. Before you start ordering your party goods, decide on a color scheme. As you can see ours is red and blue. Order enough hats, bandanas and mustaches for each guest and some extras for decorations. The paper goods are the Western Lasso Party Supplies. The birthday girl picked them out. The colors and designs works for any age and any gender. 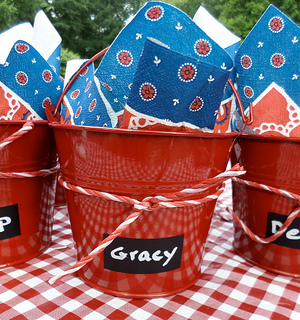 3" red tin pails are lined with colorful napkins and are used as the party centerpieces and as the take home party bags. Party favors were selected by the birthday girl and included lots of plastic horses and balls with horses in them. Kids also took home their cowboy hats and bandanas. 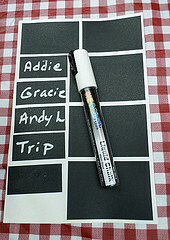 Magnetic chalk labels with the kids names stick onto the pails. Regular chalk is just too thick to write names, so I bought the White Liquid Chalk Marker with Chisel Tip. It is much easier to write with and if you mess up, just wipe off the label and do it over. Tie a red and white rope (which I found at the dollar store) around each pail. 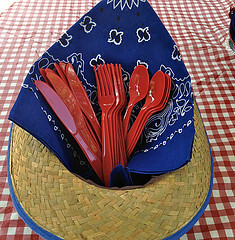 Use an extra cowboy hat with a folded bandana to hold the silverware. Turn each guest into a cowboy/cowgirl. The kids had a choice of red or blue bandanas. Get an adult to help hand them out and tie on the bandanas. Fake Mustaches will bring lots of smiles and giggles. 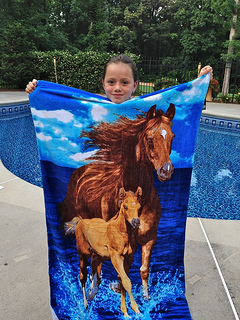 I couldn't resist getting the birthday girl this Horse Beach Towel. It's nice and soft and the colors are really this vivid and most importantly she loved it! 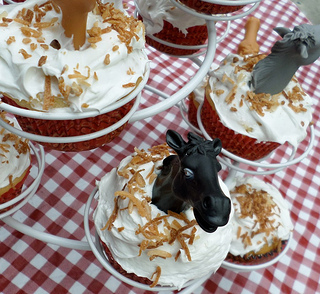 Vinyl Horse Finger Puppets are placed on top of white frosting with scattered browned coconut for hay. 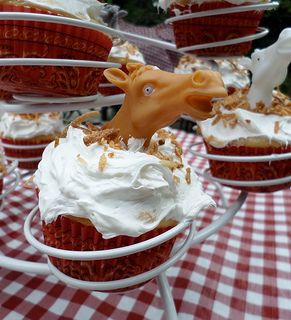 I used the cupcake liners from the Cowboy Cupcake Kit. Kids loved their plastic finger puppets and played with them in the water and took them home as part of their party favors. The liners kept most of their red color because a white cake mix was used. If you are making a chocolate cake, don't bother, as neither the design nor the color will show. Corral the Horses and Ride'm Cowboy along with some fun relays with rubber horse shoes kept kids swimming and screaming. 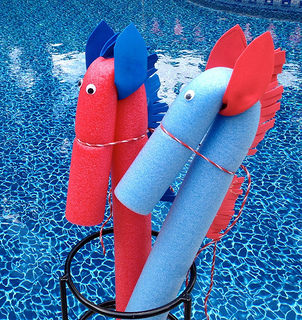 Plain swimming pool noodles become horses complete with bridles and manes made out of foam sheets. Two teams, The Mustangs and the Stallions, raced across the pool for lots of giddy-up fun. 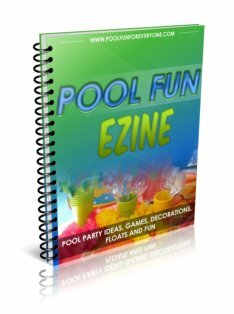 Wait til you see what fun the 'partners had with inflatable horses and a diving board! 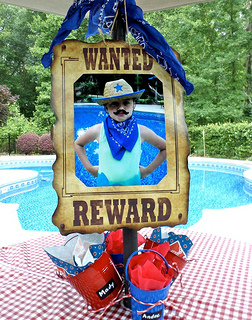 Have some giddy-up fun with this kids pool party theme like we did and make it a day to remember. 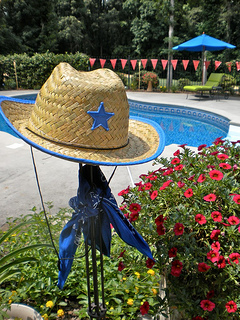 For boys and girls who love horses and cowboys, this pool party idea will make for one memorable celebration.